Anyone who reads this blog on a regular basis knows how much I admire and respect those writers who break rules and challenge themselves and their readers. Nowhere is this truer than in the romance genre, whose traditions and expectations are, perhaps, more hidebound than most. 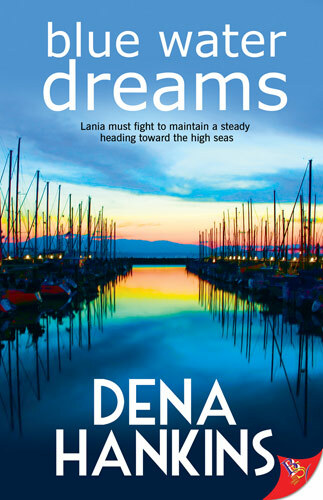 In her debut novel, Blue Water Dreams, Dena Hankins has made some interesting choices that pay off in a big way. Lania Marchiol, a cis woman who enjoys her freedom and independence editing a magazine she prints the old-fashioned way, finds both of those threatened by transman documentary filmmaker Oly Rassmussen. They couldn’t have fallen in love at a worse time. Lania is transitioning from part-time optician and full-time small circulation magazine editor to buying a boat and sailing around the world single-handedly. Oly is finishing up a film he made with his best friend, Jeremy. When love enters the picture, whose plans get derailed? Whose dream gets sacrificed? Whose life becomes secondary? Most romances open and close on the hinges of emotion, but what I found refreshing in Blue Water Dreams was its non-cynical intellectualism. That’s not to say characters in many romances aren’t smart. They just don’t converse like they are. We see Lania and Oly and their friends engaging in interesting philosophical discussions–not so much as to overwhelm the reader, but enough that we understand their deeply-held viewpoints and opinions. And what’s especially delicious here is seeing how the flow of their emotions totally overwhelm the intellectual distance they attempt to maintain. That’s really the balance and equilibrium that gets disrupted here. But that wouldn’t be nearly as worthwhile if the characters weren’t as well-drawn as Hankins manages. Lania is pitch-perfect. I loved her inability to depend on anyone as well as how she learns to reel that back in so that she can maintain her relationship. The scene where they argue power dynamics over who gets to pay the check is telling in more ways than one. And Hankins has done an equally thorough job on Oly, a challenging love-’em-and-leave-’em kinda guy who has fallen in love with great reluctance and more than a little fear. Of the important secondary characters, both Oly’s best friend, Jeremy, and Lania’s father, Adam, have their moments in the sun. As a fully rounded character, Jeremy has the edge over Adam, who seems to be a bit one-dimensional at times, but this is a minor quibble at best. Jeremy may seem more involved because his dreams are linked with Oly’s, and Adam doesn’t have that advantage. That small point aside, Blue Water Dreams is a very interesting and totally engaging read that treads some interesting paths before it ultimately turns towards its HEA, and by the time you get there, you feel as if the characters have earned it. Even more exciting is seeing Hankins’s vision and knowing that whatever her next project is, it’ll be on the TBR pile.